Denise Preskitt from partner site Mousesteps.com visited Walt Disney World for July 3rd and has photos to share! 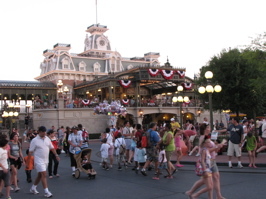 The Magic Kingdom was draped in the stars and stripes for July 4th. 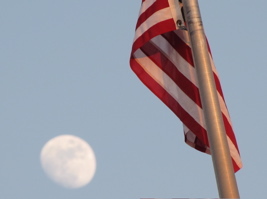 The train station is a backdrop to the growing crowds (below left) and the moon shines behind the American flag (below, right).